Message from Erin: This morning I had the rare treat of going for a walk in the woods. I can not tell you how much this helped me. I could feel things mend deep inside of me as I went through the forest, accompanied by family. It is such a simple thing to do, to go for a walk in nature, but how often do I allow myself this necessity? As I think about the life I want to create myself, and the lifestyle I want to live, I know that I am going to put this on my list of things to do each week. Even if it’s just a few minutes by some trees, I know that it is so important for me to make that connection to nature each week. It helps to heal, and it helps me to be grounded. 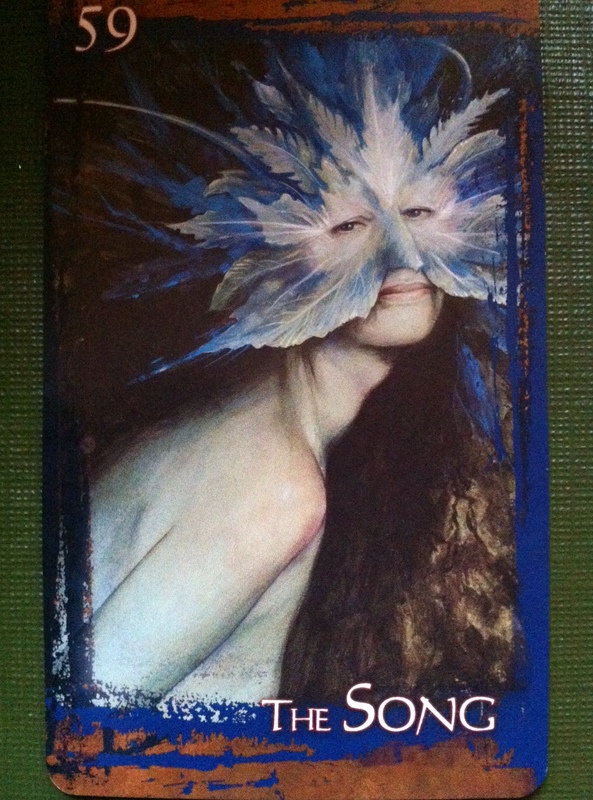 I feel like that is what the mask that the faerie in this card represents – the leaves of trees – nature. I can easily get caught up in the day to day of life and I forget this much needed weekly respite with the plants, the earth, fresh air and animals. Perhaps you will feel inspired to do the same. Message from the Faeries: The Song represents the vibrational energies of the Universe. Each being, each object, each space, EVERYTHING carries a vibrational energy. Everything has a song. Some songs sounds like sweet melodies to your ear, but some songs can make you feel sick to your stomach. Some vibrations really resonate deep within our souls, whereas other songs can feel like nails running down a chalkboard. Some energies feel “good” and other energies feel “bad”. The important thing to recognize and understand is what feels right for you and what doesn’t. When you walk into a room and you don’t like the vibrational energy, you have options. You can leave the room. You can change the vibrational energy of the room to suit your own needs through prayer, by asking for protection from us faeries, the angels or your protective guides, or you can burn some incense or sage to clear the space. You have so many options, and the answer may be different each time you don’t like the vibrational energy of the space you are in. What do you do when you don’t like another person’s vibrational energy? You can always leave the presence of that person, but if that is not an option there are other things you can do. You can create a energy bubble around yourself and not allow that person’s vibrational energy to have an influence over your own. You could make the active decision to not allow that person to have an impact over your vibrational energy. There is no need for you to adapt to suit their energies. Sometimes some of you may find yourselves at the mercy of a massive vibrational shift that is happening on the planet. Some of you might be very sensitive to these energies. If you can, we highly recommend that you take these times to have some rest, as your body is strongly affected by these huge energy shifts. We also ask that you take this time to use prayer for protection. Ask that a protective sphere be placed around you. This will help lessen the blow from these massive waves of energy. You don’t need to be a victim to energies and vibrations. It is up to you to be proactive about your experiences as a human being. There is no need for you to be at the whims and mercy of other vibrational energies that are not in harmony with your own. We hope that you find it within yourselves to learn your own song, and to allow your soul to sing along in harmony with the energies that are singing in unison with you. This entry was posted in Faerie Reading and tagged Faerie Reading, Faeries, fairy, Tarot, Tarot Reading by faeriemessenger. Bookmark the permalink.